I have not baked cheesecake in a very long time. One day, while clearing my refrigerator, I found a box of cream cheese that has been sitting at the corner for an embarrassing amount of time. It was just two months before it’s used by date so I turned to my old time favourite cheesecake recipe. And I fell in love with it all over again. The cake was finished in two days. So I went out to buy another box of cream cheese and made this cake again the week after. This happens to me quite a bit especially when I get fixated on one dessert, I start to make it in quick successions. Is anyone guilty of this too? Two weeks and two cheesecakes after, I am here blogging about this old favourite that I am not sure why I’m not sharing until now. This cheesecake has got to be my favourite one. I’ve adapted Harumi Kurihara‘s Baked cheesecake recipe from Harumi’s Japanese Home Cooking (one of my first few cookbooks). This baked cheesecake is the golden mean of all cheesecakes; it has found the exacting balance of rich and light. It is not your average rich, creamy and dense New York style cheesecakes nor your light as air cotton-souffle cheesecake. This one is easy to make but kind of complicated to describe. It taste different at different temperatures – as Harumi puts it herself, it is like having different cakes! When it is still slightly warm, the center is slightly wobbly, the cake is soft, fluffy and almost souffle light. While when it has been chilled, it becomes a denser, creamier cake. I find it hard to pick my favourite way of eating this cake because both of equally good for different occasions, moods, weather. I like adding raspberries and blueberries to this cake because the berries add a nice tartness to the creaminess of the cheese. You can, of course, choose to leave them out if you wish. I make my own biscuit base for this cheesecake because well, I can. And I do like this crumbly base more than a usual style graham crackers or digestives base. I always make a slightly thicker than usual biscuit base for my cheesecake because I think a higher ratio of biscuit to cream cheese is spot on. It does helps that no one would have to fight over the biscuit part of the cheesecake as it happens frequently in my family. You don’t have to worry too much about making this – it is extremely easy and very forgiving for someone new to baking. There’s no need for bain maries and water-baths. The cake is baked at a constant temperature, if it doesn’t brown evenly on the top, you can turn it around so the all sides can brown evenly. If the top starts cracking excessively, turn down the temperature of your oven slightly. I hope I have not bore you with so much details of one cheesecake. I shall just leave you with the recipe and let you decide for yourself how much you like this one. This has got to be my favourite cheesecake recipe. I’ve been baking this even before I went to Le Cordon Bleu. Harumi Kurihara (often referred to as the Japanese Martha Stewart) makes this cheesecake with mixing butter with digestive biscuits (you can use 100g biscuits and 40g butter) to form the base. I prefer baking my own base because I think it taste better and it doesn’t take much effort. Other than that, I added zest to give it a more pronounced citrus flavour and increased the sugar just a teeny bit. Adding berries to it also gives it a lovely touch. This cheesecake is for those who like a lighter style cheesecake; it is not and doesn’t try to be your rich, dense and creamy New York style versions. One interesting thing about this cake is that this cake taste different at different temperatures. When it still slightly warm, it is soft, fluffy souffle-like goodness. 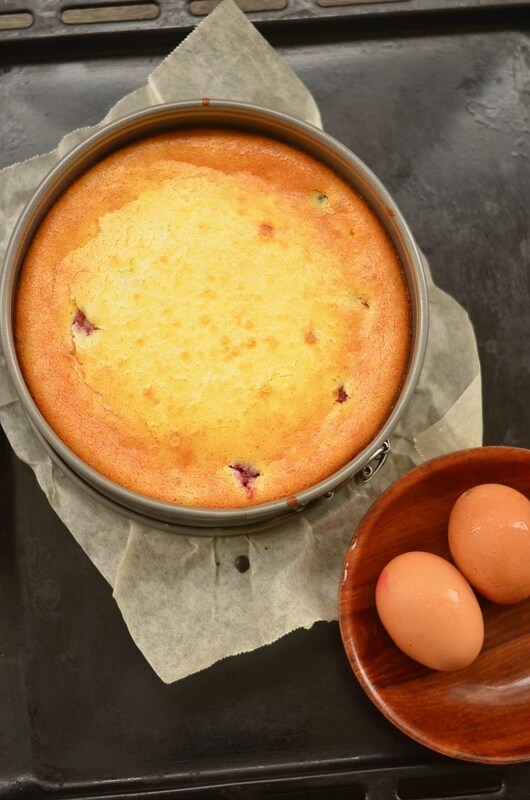 After you refrigerate the cake, it becomes denser and creamier. I still can’t decide which is my preferred way of eating it after baking this more than dozens of times. 1. Line a spring form cake tin with parchment paper and lightly grease the bottom and sides with butter. 2. 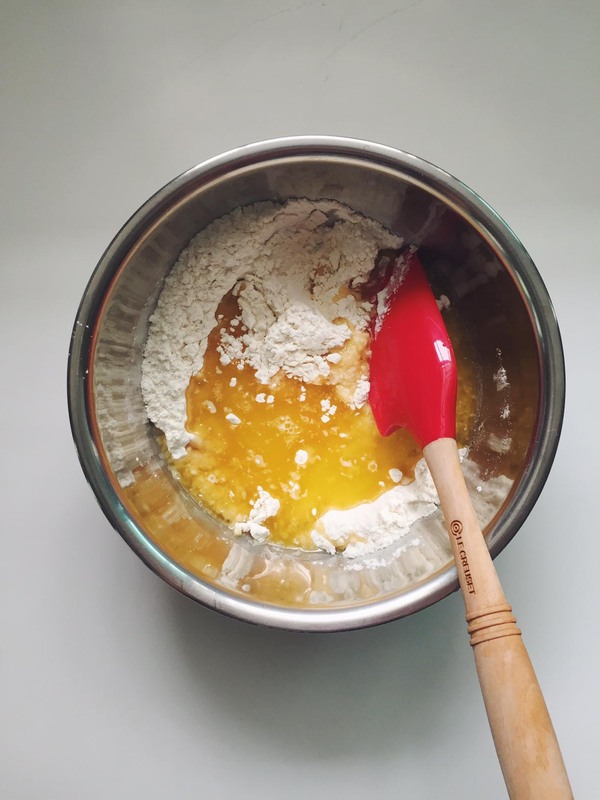 Make the biscuit base: In a bowl, mix together flour, sugar, salt, vanilla extract and melted butter until smooth. 3. Transfer this batter into the cake tin. Using your fingers/ the back of a spatula, push the biscuit the base to all corners and making sure it is level. I like a higher biscuit ratio to cake so I like to line the sides of the cake tin as well (about 1 – 1.5cm all round). 4. Bake the biscuit base in a preheated 180 degree celcius oven for about 22 -25 minutes or until golden brown. 5. While the biscuit is baking, you can start to prepare your cream cheese filling. 6. For the cream cheese filling: Cream the cream cheese and sugar with a paddle attachment until smooth, fluffy, scrapping down the sides as you go along. 7. Add in the egg one at a time and mix well to incorporate (on medium speed). Then add in the rest of the ingredients in the order given in the recipe, mixing each one thoroughly first before adding the next. The mixture should be thickened and smooth. 8. 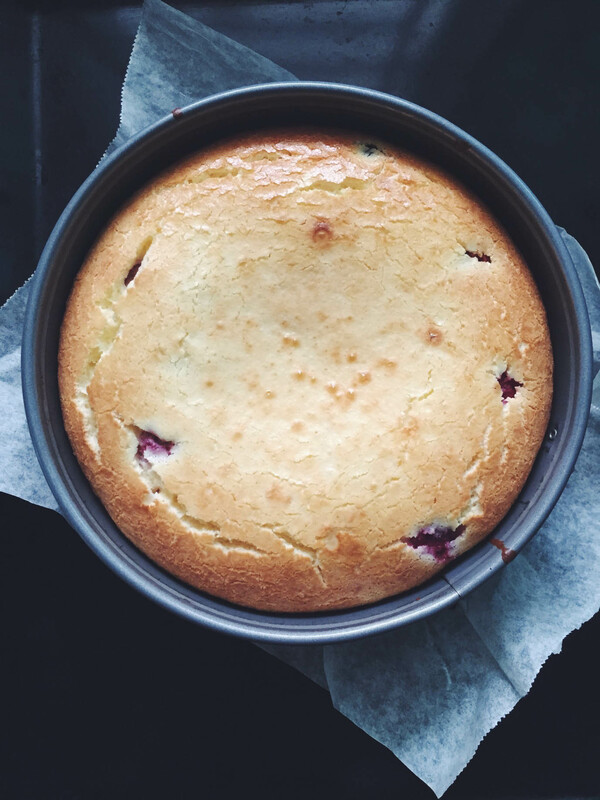 Fold in the raspberries and blueberries with a spatula and transfer the filling into the baked biscuit base. 9. Lower the temperature of the oven to 170 degrees celcius and bake for about 50 minutes or until the top is slightly golden brown. The cake should be set in the middle. 10. 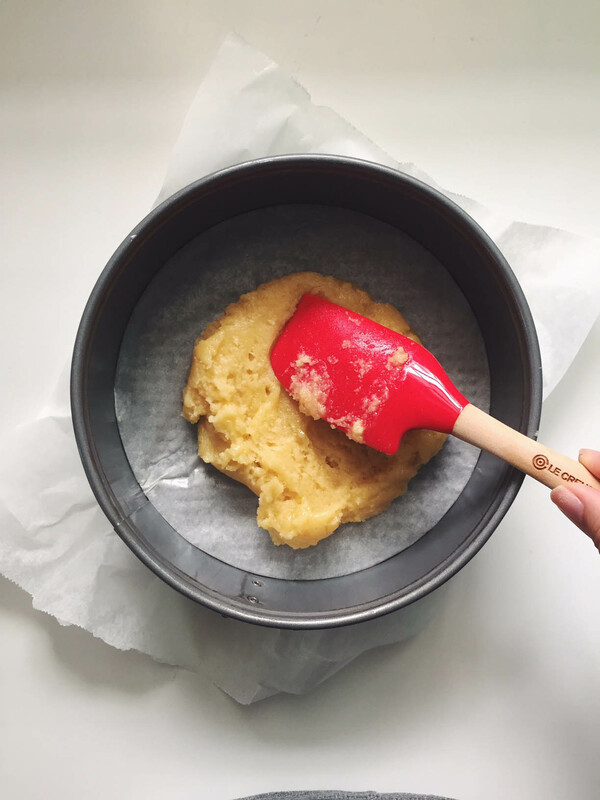 Transfer the cake to a cooling rack and allow it to cool for about 15 – 20 minutes before running a palette knife around the sides of the tin and transferring the cake out onto a cake board. You can eat it immediately or allow it to chill down completely in the refrigerator before serving. I started this blog with a post on tarte aux fruits (fruit tart). Fast forward four years and one hundred and eighty-four posts later, it remains as one of my favourite tarts and maybe dessert of all time. I get many requests to bake this on numerous occasions, for birthdays and celebrations; I can’t quite keep track of the number of times I have made a fruit tart over the past few years. I’ve made variations of it and this recipe is my current favourite so it seems befitting to post tarte aux fruits 2.0 here. While the first version of my tarte aux fruits (fruit tart) is a classic one – one with a basic pâte sucrée, a rich and smooth vanilla crème pâtisserie with fruits, this one takes a spin on the pastry and filling. The pastry uses icing/confectioner’s sugar which makes it more crumbly and the almond meal that replaces some of the flour gives it more flavour. 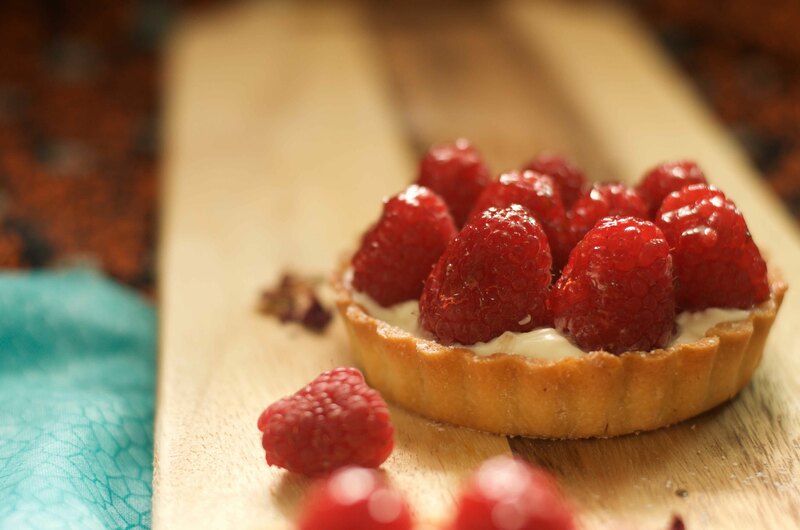 The crème pâtisserie is lightened with some whipped cream which makes it a lot lighter without taking away its beautiful vanilla flavour that complements the berries. 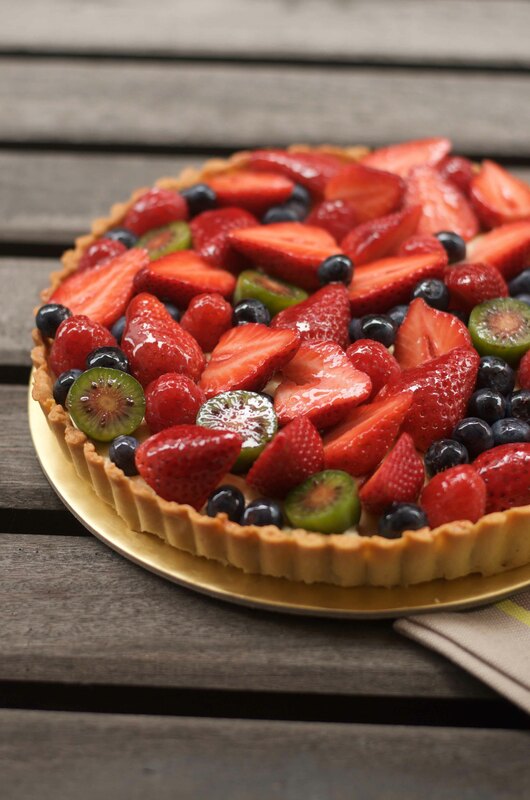 Oh yes, berries are my favourite fruits to use on a fruit tart. I can’t imagine any other fruit that better complements the vanilla bean speckled pastry cream. I’m most probably bias and you don’t have to take my word for it; do go for any fruit you like and has a nice shape (and holds it shape). There is no single way to arrange the fruits on a fruit tart – you can do it in neat concentric circles or give it a “just thrown together” look like what I did here. 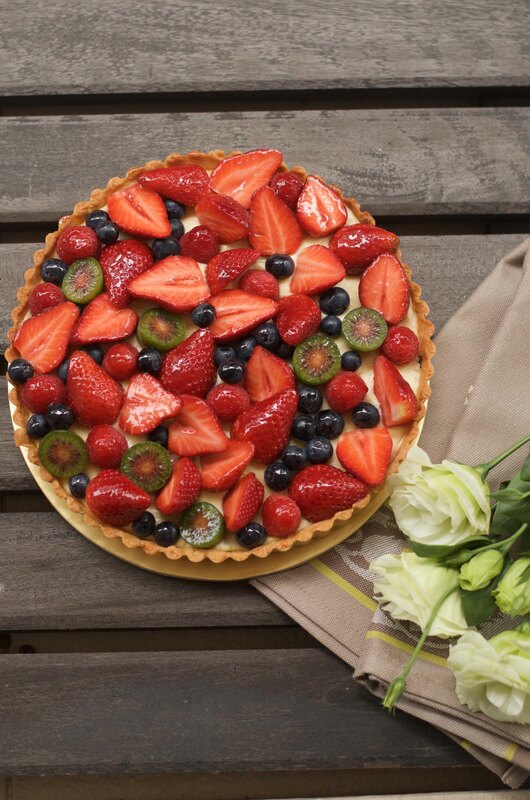 A couple of tips to on making a fruit tart pretty – 1) consider the shapes of the fruits that you are using, 2) consider the colours of the fruits you are using, 3) make sure that you cover most of the pastry cream by overlapping the fruits so you cannot see the pastry cream, 4) give it a bit of height. Most importantly, enjoy yourself doing this and I believe the tart will come together very nicely. I find that tarte aux fruits and its variations are always well-appreciated even by the people who claim not to be dessert people and the people who claimed that they are on a diet. I’ve witness both camps “fall prey” to the fruit tart, not that I intentionally tempt them with tart. You can find tarte aux fruits 1.0 via the link here. I use both recipes all the time and I can assure you that both works very well. At this current moment, I prefer this new version for its lighter version of the pastry cream which allows you to eat a bigger slice of tart without feeling too heavy. 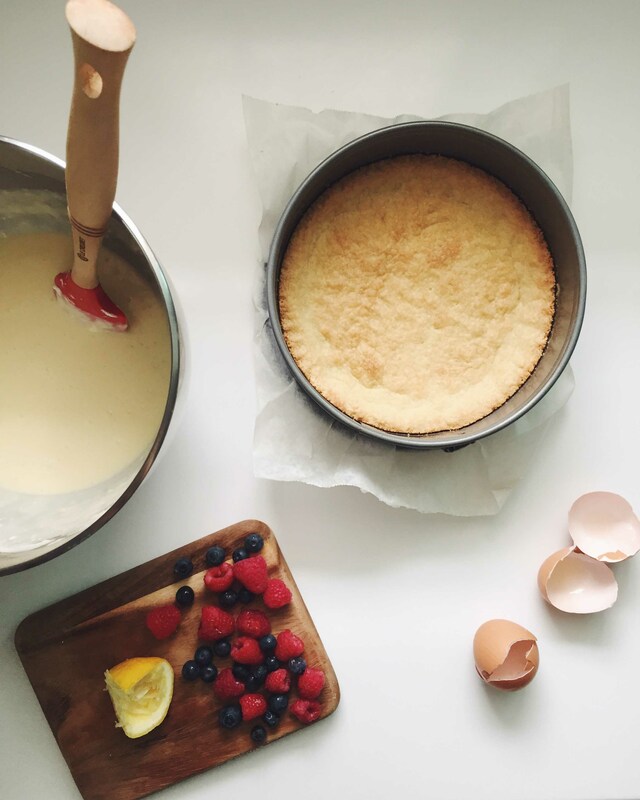 This sweet shortcrust pastry is also crumblier with the use of icing sugar instead of caster sugar which makes it a little finicky on warm and humid days. You only need half the recipe for one tart but I like to make the full recipe as the dough keeps well – one week in the fridge and a month in the freezer. 1. Cream butter and icing sugar until smooth. Add in egg and vanilla extract and mix until well-incorporated. 2. Mix in the dry ingredients until just combined, without overworking the dough. 3. Transfer dough onto cling wrap into two flat discs. Cling wrap dough and allow it to chill in the fridge for at least 30 mins, or overnight. 4. Rolling the dough: Place one of the disc onto a floured surface. I like to roll the dough in between two sheets of cling wrap. Roll it to about 3 mm thickness to a size bigger than the base of your tart ring, flouring sparingly every now and then to prevent the dough from sticking onto the surface. 5. Transfer the dough into the tart ring, pushing the dough to the sides and trimming off the excess. I like to rest my tart before baking at this stage – any amount of time between 15 -30 minutes is good as it helps relaxes the gluten that is formed during the rolling. 6. Preheat your oven to 180 degrees Celsius. Place a sheet of crumbled parchment paper over the top of the tart shell and weigh it down with baking weights or uncooked rice/beans. This will prevent the sides of the tart from sliding. 7. Blind bake the tart shell for about 25 minutes or until golden brown. Remove the rice/beans during the last 5 minutes of the baking time and continue baking so that the tart base can brown slightly. This version of the pastry is lightened with lightly whipped cream which gives it a lighter mouthfeel and quite frankly, this lightened pastry cream has began to take over all my fruit tarts. This recipe makes enough to fill two tarts. 1. Prepare and measure all the ingredients before you start. You wouldn’t want to cry over spilled milk when you are rushing while the milk is boiling. 2. Place milk and scrapped vanilla bean into a medium size pot (big enough for all the ingredients). 3. In the meantime, whisk egg yolks with sugar in a separate bowl until well-combined before adding the cornflour. Whisk till mixture is uniform. 4. When the milk comes to a boil, take the milk off the heat and pour it into your egg mixture while whisking quickly. 5. Pour the milk and egg mixture back into pot (under low heat) and whisk continuously (as if your life depends on it!) This step is crucial to prevent lumps from forming in the crème patisserie. 6. Ensure that you whisk under low to medium heat until a smooth, thickened paste. Allow the crème patisserie to cook for at least 2-3 minutes before taking it off the heat. You should see one or two large bubbles forming. That is an indication that the pastry cream is done. 7. Whisk in the cubed butter until well-combined. 8. Transfer the pastry cream, using a scrapper, onto a tray lined with cling wrap. Cling wrap the pastry cream. Cool it down in the fridge before using it. 9. Before using the pastry cream, transfer it into a bowl and whisk it up until smooth and lump-free. Whisk the whipping cream in a separate, grease-free bowl to soft peaks. 10. Fold the cream into the pastry cream in two or three additions. Use immediately. Secure tart base onto cardboard with some pastry cream to prevent the tart from sliding while you transport it/move it around. 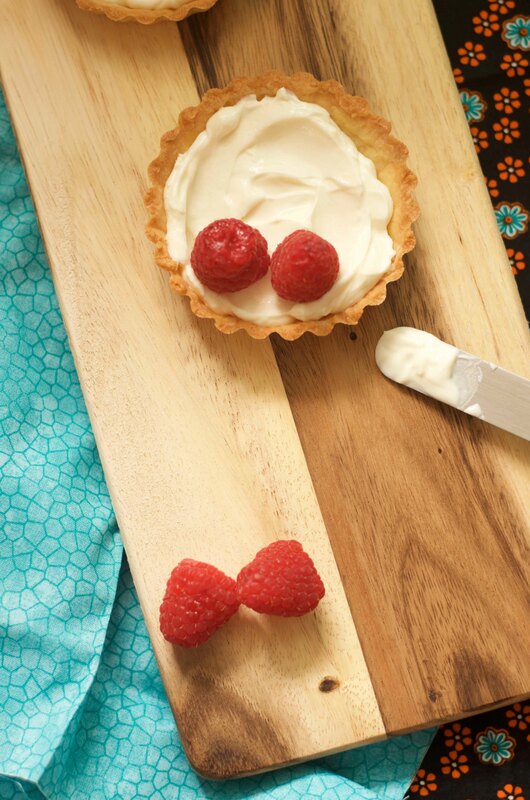 Use a pastry brush to brush on the melted white chocolate on the tart base. This will prevent the moisture from the pastry cream from softening your tart base. Allow the chocolate to set – takes a couple of minutes. Using a piping bag, pipe in the lightened pastry cream to fill the tart about 3/4 way. Alternatively, you can spoon the cream into the tart then even it out with a small palette knife. 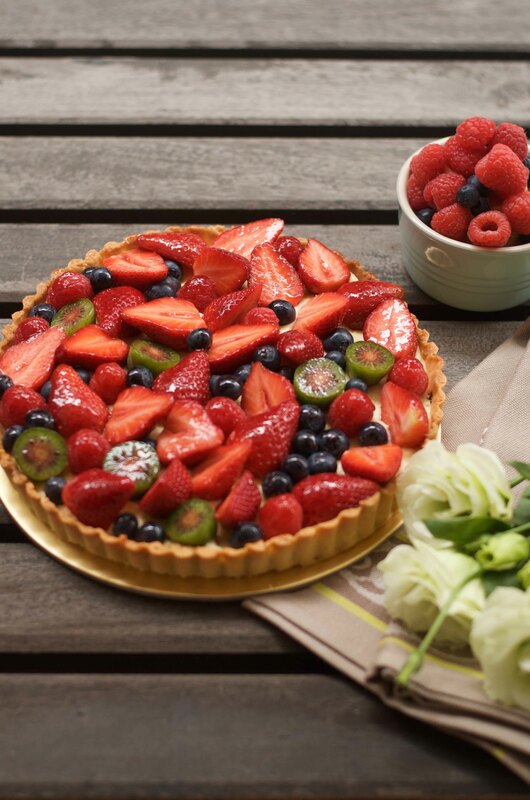 Decorate your tart with sliced berries in any style you like. Scoop in some neutral glaze or apricot jam into a small pot with a few drops of water (about 1-2 tsp of water to 1 tbsp jam). Bring it to a boil and use immediately with a pastry brush to brush over the fruits. The glaze gives the berries an attractive look as well as to preserve the fruits on the tart especially the sliced surfaces. I have an unhealthy obsession that I’ve been trying to quit. I’ve been amassing far too many cookbooks that my bookshelves can take. While I’m an e-book covert and I’ve been reading fiction digitally, I still prefer my cookbooks in my hands where I can hold and flip through the mouthwatering photography. I don’t cook from all my cookbooks as much as I wish to. I flip through them to get inspiration while I don’t almost follow every recipe in them. 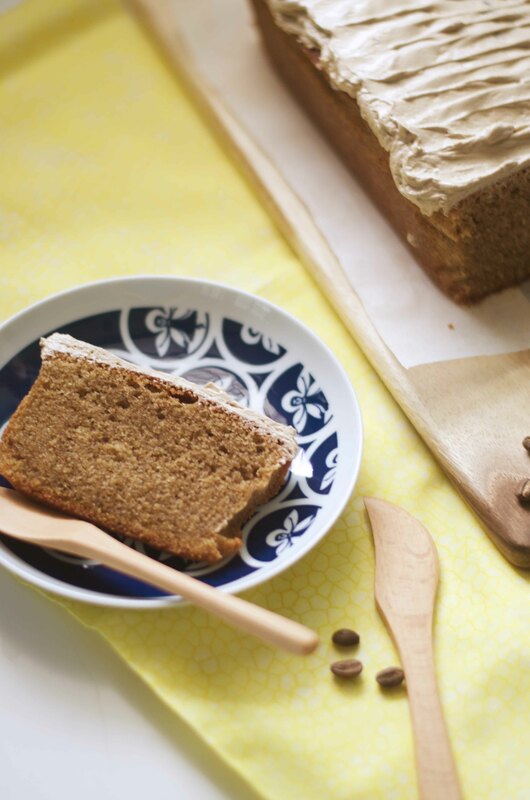 This coffee cake comes from flipping through Nigel Slater’s The Kitchen Diaries ( a very good cookbook, by the way). It just looks and sounds delicious that I decided to give it a go with a few adaptations, replacing some brown sugar with granulated sugar, increasing the amount of coffee slightly and frosting it with a lighter Swiss meringue buttercream instead of a French buttercream. 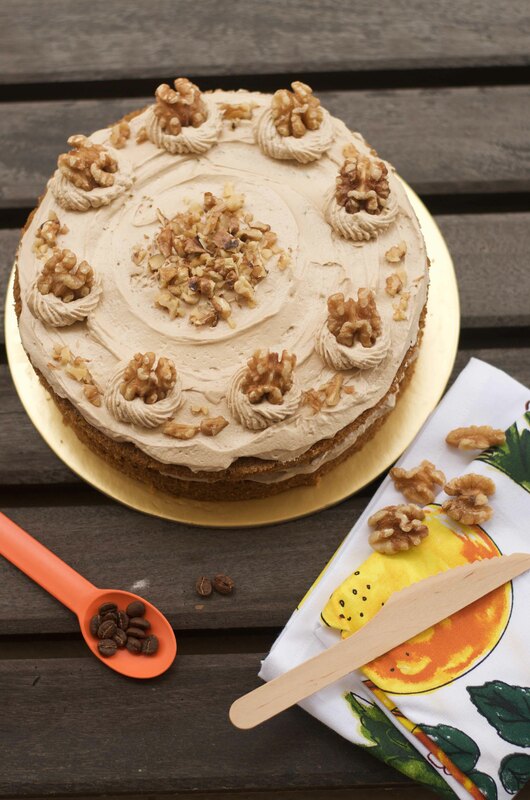 The result is a good old-fashioned light and fluffy coffee and walnut cake that I wouldn’t hesitate to bake and eat over and over again. The second time I baked this was in the form of a loaf cake without walnuts, and with some adjustments to the baking temperature and time. It is less indulgent, with a single thin layer of Swiss meringue buttercream on the top but in no way less delicious. I realised that I hardly bake any coffee cakes or desserts though I love my coffee and do take it very seriously. Perhaps this cake will cement my love for coffee in desserts? I honestly think it isn’t a bad idea at all. 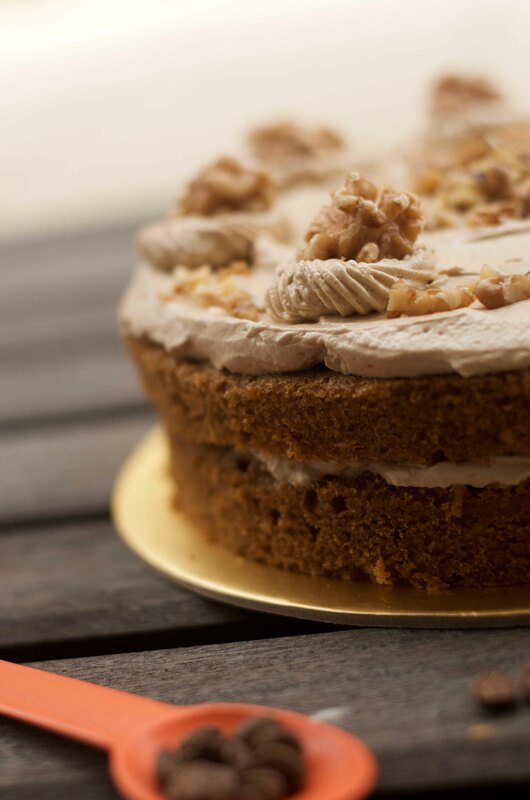 The coffee cake has a lovely texture to it – it is light and fluffy and has good coffee flavour. I like toasting my walnuts before adding them to the cake as I think it helps bring out its flavour more. 1. Preheat the oven to 180 degrees celcius. Line two 8″ spring form cake tins with parchment paper and grease the tins with some butter. Using a paddle attachment, cream butter until smooth. Add in both the granulated sugar and brown sugar and cream until pale and fluffy, scrapping down the sides of the bowl as you go along. 2. Add in the eggs, one at a time and mixing until well-incorporated, scrape down the sides of the bowl after mixing in each egg. Add in the vanilla extract. 3. In a cup, dissolve the coffee granules with boiling water and stir until it is completely dissolved. Allow it to cool before using. Toast up the walnuts until warm to touch before allowing them to cool before using. 4. Sift together the flour, baking powder and salt in a separate bowl. Add the flour mixture into the batter in two additions, mixing it at low speed only until the mixture comes together. 5. Stir in the coffee until the batter is uniform before you stir in 65g of the chopped walnuts. 6. 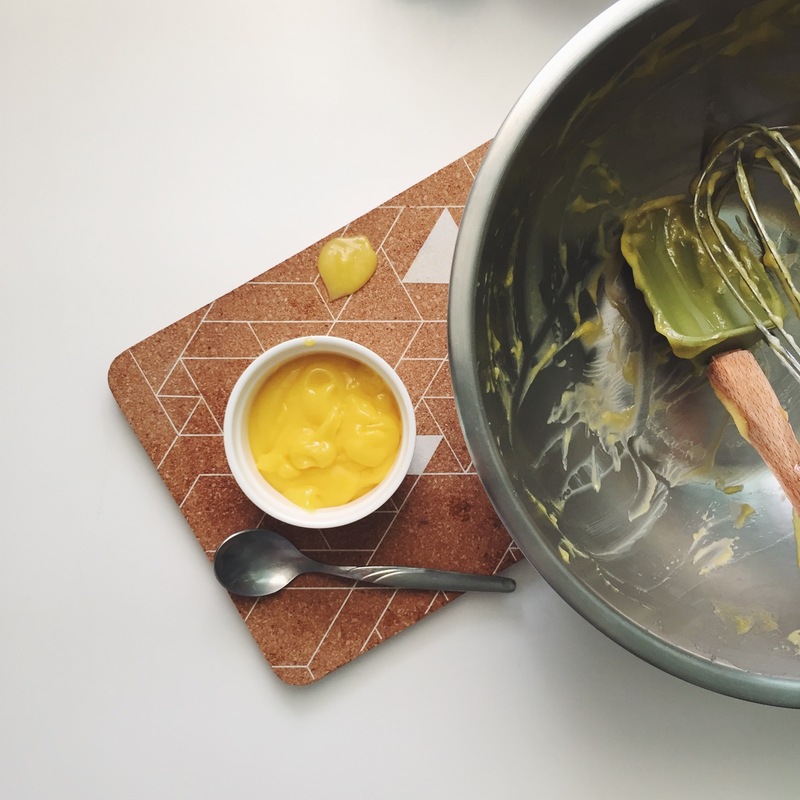 Divide the batter equally between the two spring form cake tins and tap the tins twice on the kitchen counter before placing the cake into the pre-heated oven for about 25 minutes or until cakes spring back upon touch and/or a cake tester comes out clean. If you are making a loaf cake, simply pour all the batter into your parchment lined loaf tin and bake at 165 degrees celcius for about 45 to 50 mins. There will be enough SMBC to ice the sides of this two layer cake. I had some leftover SMBC when I did this. 1. Prepare the SMBC: Whisk together egg whites and sugar in a heatproof mixer bowl over a bain marie. Heat until egg white mixture is 70 deg celcius or until sugar has dissolved completely. Dissolve your coffee granules in boiling water and let it cool down before using. 2. Then using a machine with a whisk attachment, whisk on medium-high speed for 8 minutes until stiff peaks have formed and the meringue has cooled to room temperature. 3. At this point, swap your whisk attachment for a paddle attachment and turn down the speed to medium. Add in the butter gradually, a few cubes at a time. Make sure that the butter had been incorporated before adding more. Keep beating until the SMBC comes together (about 5 mins). If the butter is too melted, place in freezer for 5 mins and beat at low speed until it comes together. 4. Gradually, add in the coffee and mix at low speed until well-incorporated. You can use the SMBC at this point. Use a palette knife to spread onto your cake. * It is important to have your butter at room temperature, softened but not melting. * Add in a few cubes of butter at a time and allow it to incorporate before adding more. * If the mixture starts to curdle, don’t panic. The butter is probably too melted. Place the mixer bowl into a fridge to allow it to chill slightly before beating the mixture at low speed until it starts to come together once again. 1. Make sure the cake layers have cooled completely before filling it with SMBC. 2. Trim the top off both the cakes (if you wish) using a palette knife. 3. Secure one layer of the cake onto a cake board with a dollop of SMBC. Then spread some of the SMBC onto the top of the cake. 4. Place the second layer of the cake on top of the first and push it down slightly. 5. Spread a layer of SMBC on top of the second cake layer. Decorate with chopped walnuts. Rose is such an maligned flavour; most people would avoid it like plague thinking it taste like bandung, a drink made with rose syrup and evaporated milk that is overly sweet and syrupy, in my opinion, but is very popular in Singapore and Malaysia); otherwise, they tend to overlook it for more exciting flavours. I used to fall in the former category but I’m unabashedly now a rose convert. I love the subtle flavour that rose brings with it – be it in cakes, macarons or sablés. I would believe you can now tell from the number of posts relating to rose on my blog. This dessert brings my two favourites on the same plate, tarts and rose, which makes it a winner in my books from the very genesis of it. The flavours of this tart ended up to be very delicious. 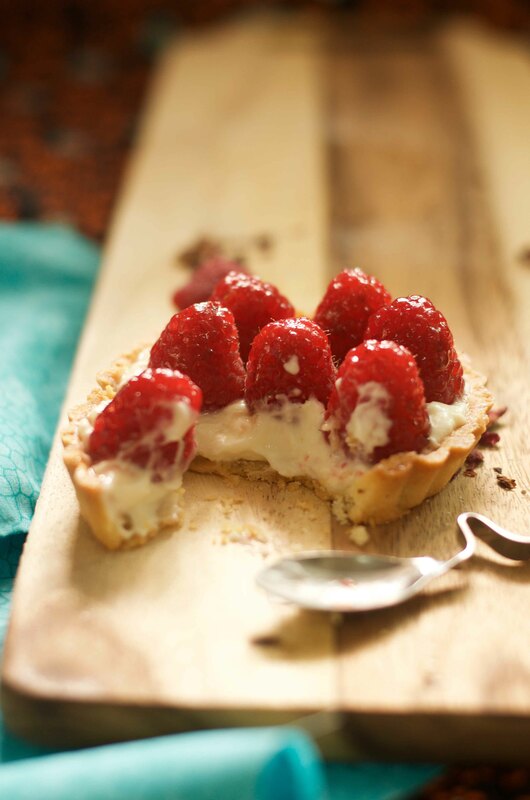 The lush creamy filling with that delicate flavour of rose pairs very well with the fresh raspberries and the crumbly tart. The filling is too easy to put together compared to some other more effort-consuming ones like créme patisserie (pastry cream) or curd. The only thing it calls for is to be assembled when it’s made as the whey in Greek yogurt may start to separate if you leave it out for too long. I had some leftover filling cling wrapped in the fridge for two days, and when that happened, I simply poured out the whey, gave it a quick whisk to combine before using. There’s nothing to fret about. I only wished I remembered that I had some rose water flavoured meringues sitting at the end of my kitchen counter. I would have crushed them roughly and sprinkled them over the tarts – it would have looked pretty as well as reinforcing the rose flavour. But alas, my slow brain didn’t realise it until the tarts were mostly finished. That is probably just one reason why I would be making these again. I hope you will too. The flavour of rose and raspberry goes brilliantly together. The filling is simple to put together. It has a subtle rose flavour that carries through with the creamy and luscious mascarpone and the slightly tart flavour of the Greek yogurt. Simply delicious! This tart is extremely buttery and crumbly (very delicious) but it also means it is more finicky to work with than with other doughs. The first time, I baked these strips of dough and they started to bend and curve while in the oven. The second time I did that, I baked a whole sheet of dough and only cut them into strips midway through baking. 1. Cream butter using a mixer fitted with a paddle attachment until soft and creamy. Add the sifted sugar, almonds, salt, vanilla, egg and blend the ingredients on low speed, scrapping down the sides of the bowl as needed. 2. Add in the flour in three additions and mix only until the mixture comes together to form a soft and moist dough. Do not overwork the dough. 3. Cling wrap the dough and allow it to rest in the fridge for at least 4 hrs (I left it overnight). 4. Roll the dough out on a floured surface. This dough is pretty difficult to work with becuase of the high butter content. Best to do it in a cool room. You may also find it easier to roll the dough into between two sheets of plastic wrap. Roll it to about 3mm thickness. Allow it to chill in the fridge for about 20 minutes. Bake in a 180 degrees celcius, preheated for about 15 mins or until golden brown, tart shells would take longer. Store biscuits in an air-tight container. 1. Place mascarpone cheese into a stand mixer and blend until smooth with a paddle attachment. Add in the Greek yogurt and blend until incorporated. 2. Add in sifted icing sugar and rose water and blend until incorporated. Use immediately. 1. Fill the cooled tart shells with the rose mascarpone and yogurt filling with either a piping bag or a spoon. Smooth the surface with the back of a spoon or a small palette knife. 2. 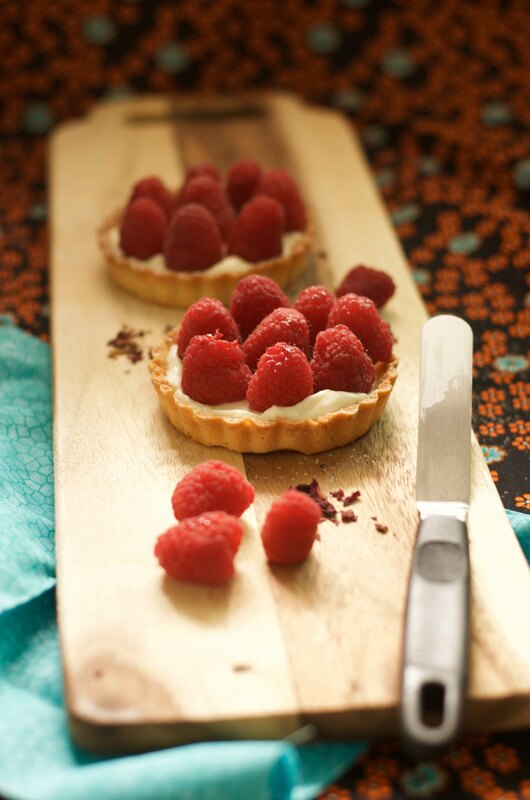 Place fresh raspberries neatly on the tart. 3. Heat up some neutral glaze or apricot jam with a little bit of water. Bring it close to a boil and use a small brush to brush the glaze on the raspberries. 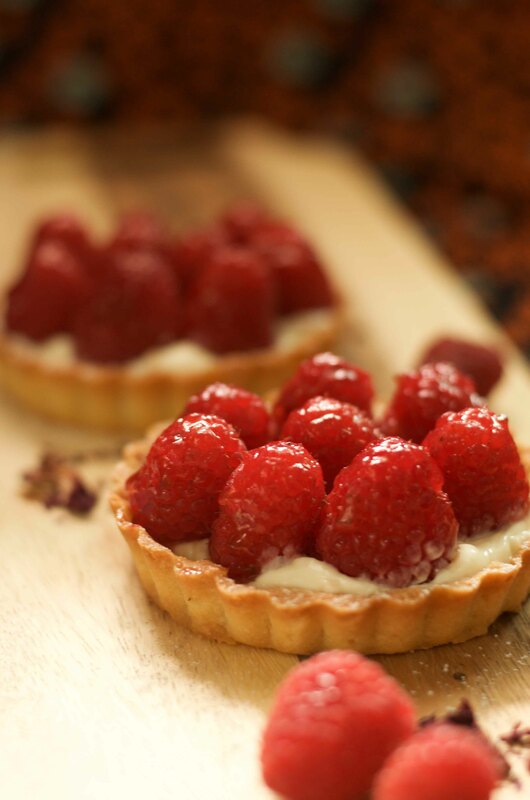 If you are eating the tart immediately, you can omit this step and dust the raspberries with some sifted icing sugar. 4. The tart would be lovely with some crushed rose flavoured meringues (if you happen to have them). The tart is best served on the day it is made. 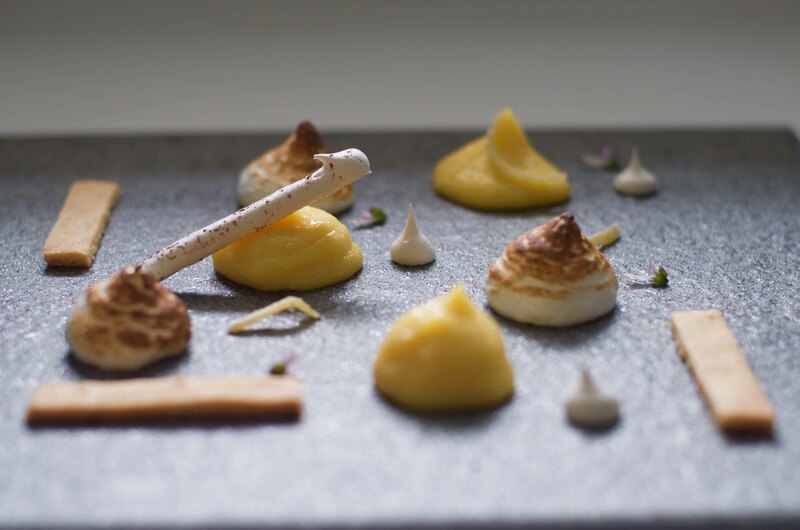 Just last weekend, I’ve put together a plated lemon meringue dessert. It is a familiar flavour of lemon and meringue but not in its typical form that I’m used to making. This was born because I was trying to think about a dessert to make for my dad’s birthday dinner. After the feast we had (you can check out my instagram account, @Jothetartqueen, for pictures of the food, I wanted to make a lighter and refreshing dessert. The ingredient that is most commonly associated with refreshing is citrus. Lemon came to mind immediately and I decided not to overthink it and just run with it. Meringue naturally came along with it. The great thing about making a plated dessert is that you have a lot of time to pre-make your elements and keep them separate for a later use. This means you have dessert sorted for the rest of the week. I find that the sweet tart biscuit is kept extremely crumbly because the curd does not have the chance to soften it. 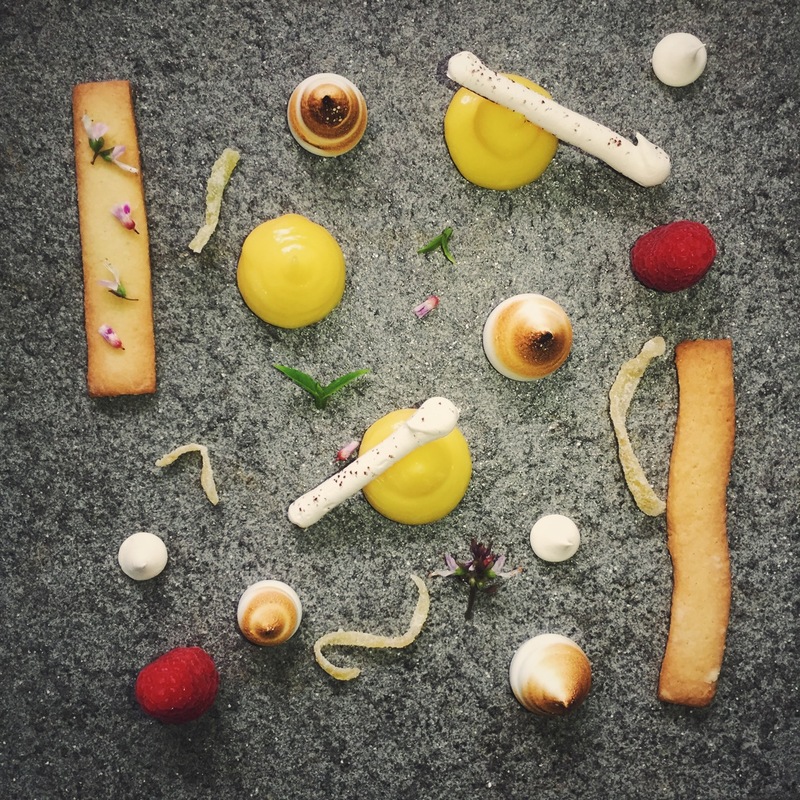 Probably the reason why Domnique Ansel decided to serve his lemon curd tart à la minute at his new venture, Dominque Ansel’s Kitchen. My intention was to serve this dessert with a sorbet, a lemon, lime and basil one. Alas! it failed on me as my KitchenAid ice cream attachment wasn’t powerful enough to churn out the sorbet in this hot weather. I probably should have done this the day before rather than on the day itself. I ended up with a granita (still good and perfect on a hot day!) but that also meant that I had to go with one less element on the plate. The dessert turned out pretty well despite the slight glitch. It made me very happy. 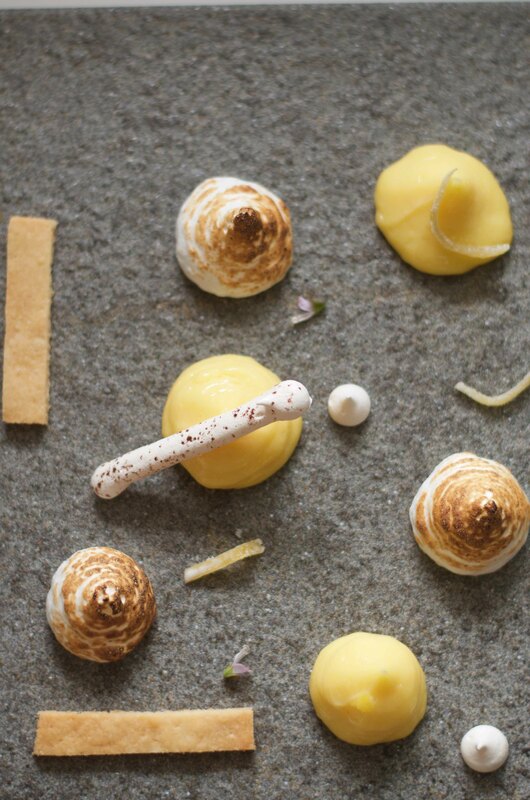 Also, who can say no to lemon meringue desert for a whole week? Adjust the quantities for the no. of desserts you have to plate. You will find yourself with a lot of extras that you can use on another day! 1. Put the lemon juice, caster sugar, and eggs into a stainless steel bowl. Whisk them over a bain-marie. 2. At first, the mixture will go frothy and bubbly. Continue whisking until it thickens until a ribbon stage. This means that as you lift the whisk from the mixture, it will fall back upon itself but should leave a trail or ‘ribbon’ across the surface. This ribbon will not immediately sink back in on itself but will hold firm.This will take a while so be patient. Cook it a little more than you would for curd to fill in the tart shells so that the curd can hold its form when piped. 3. Take the thickened mixture off heat and add in the cubed butter and whisk until incorporated. Transfer the curd into a non-reactive bowl and cling wrap it (with the cling wrap touching the surface of the curd) and allow the curd to chill in the fridge until required. Curd can be kept for a week. 1. Put in the water and caster sugar into a clean, grease-free pot. Do not stir mixture to prevent crystalisation of sugar. Cook to a soft-ball stage or until 118 degrees celcius. Use a thermometer to measure the temperature of the sugar as it boils. 2. Start whisking the egg whites until soft peak stage only when the thermometer shows that syrup is at 100 degrees celcius. 3. Once the sugar syrup reaches 118 degrees celcius, take it off the heat and allow the syrup to stop bubbling so rapidly before pouring into the egg whites. Turn the speed of the mixer to max speed while you pour the sugar syrup in a slow and steady stream. Continue to whisk the egg whites at maximum speed until stiff peaks. Then turn down to a low-medium speed and whisk until meringue is cool before using. 4. Best to make it on the day when you are serving the dessert. 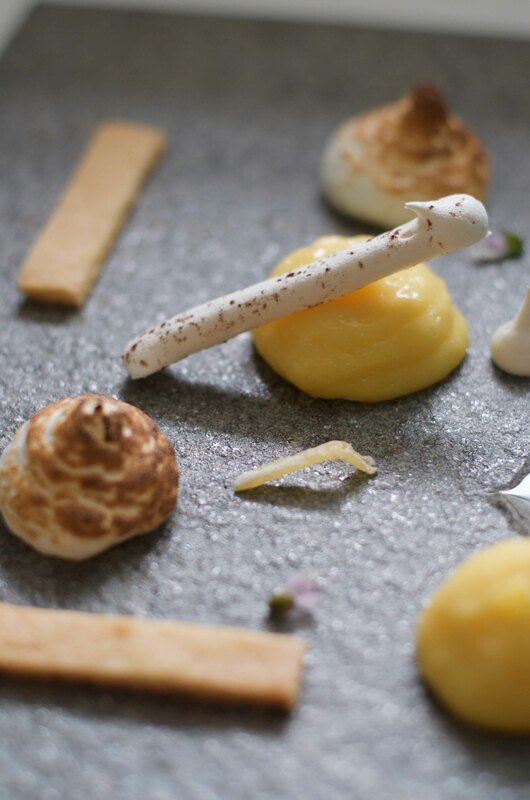 When using, pipe the italian meringue onto your plate and use the blowtorch to lightly toast your meringues. 2. Whisk together egg whites and sugar in a very clean stainless steel bowl. I use hot water to rinse it through to remove any grease and wiping it dry. 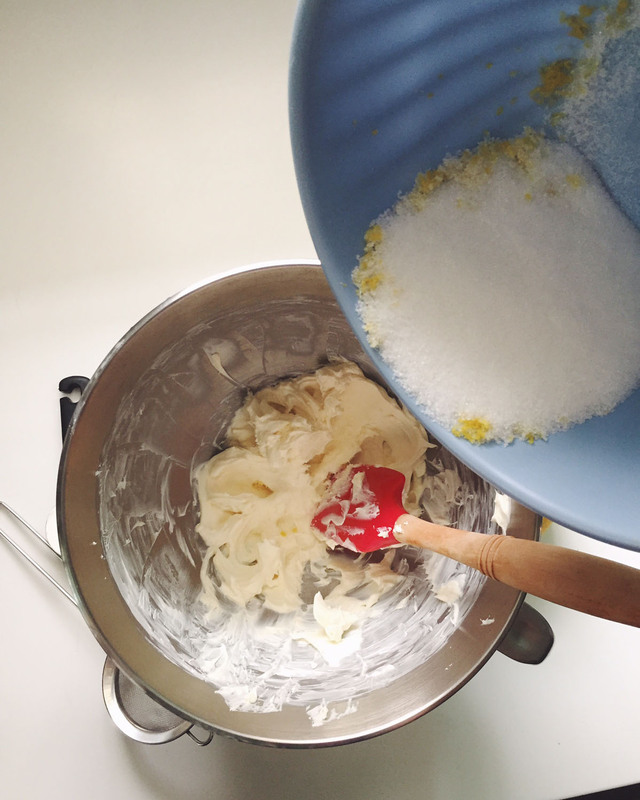 Place bowl over a bain marie and whisk together whites and sugar until sugar is completely dissolved. You will get a smooth, warm and slightly cloudy liquid. Remove from heat. 2. Transfer the warm mixture into a clean bowl of a electric mixer. Using the whisk attachment, beat for about 10 minutes on high speed until you achieve glossy white mixture with firm peaks. Firm peaks are reached when you you see straight peaks when you lift up the whisk attachment and it does not droop back into the bowl. 3. Transfer the meringue mixture into a piping bag with a small round nozzle. Pipe whatever shapes you like. They should be pretty small. Dust with some cocoa powder, optional. 4. Lower the oven temperature to 100 degrees celcius and bake for 1 hour and 45 minutes until crisp and dry.